Josh Cantwell, Grand Lake Mental Health Center adult services administrator, demonstrates how the organization's iPad program works to help clients access treatment. Patricia Tompkins wanted help for her son, Eric Tompkins. Eric, 41, of Ardmore, was suffering from severe depression, according to statements made online by Patricia and other members of Eric’s family. On the morning of Aug. 8, 2015, she suspected he had attempted to kill himself by drinking roach poison. When she called the local mental health crisis center, Patricia was told that for Eric to be admitted, the police would have to be involved first, she wrote in a posting. She was instructed to call 911. Just before 10 a.m., Patricia called the number to report her son was possibly suicidal. But that call, made in a desperate effort to save her son’s life, set off a series of events that instead ended in his death. For many with mental illness or distress, entry into the mental health system comes through a police encounter or time in jail. Mental health centers themselves have no legal authority – or the staff and resources – to take someone into what is called “protective custody” and transport them to a center for evaluation. So the first responders tend to be police officers or deputies – or jailers if an arrest is made – many of whom lack specialized training to handle the mentally ill. Use of force can occur and can be fatal. Even when it’s legally justified, mental health experts say alternatives might have been used to everyone’s benefit. In decades past, many mentally ill people were held in large state-run institutions. And while few professionals are calling for a revival of those troubled places, they say because of funding issues, the level of services once provided in institutions have not made it out into communities. Law enforcement agencies should not be left to figure it out alone, however, said Michael Brose, who heads Mental Health Association Oklahoma. The mental health community needs to reach out and work collaboratively with police on mental health issues, helping to provide resources and training, he said. Brose said some members of the mental health community worry that taking a bigger role will detract from existing services because budgets continue to get tighter. Two Ardmore Police Department officers responded to Patricia Tompkins’ 911 call. They found Eric and his mother sitting in the living room of his house, said Pontotoc County District Attorney Chris Ross, who was assigned the case after the Carter County district attorney recused himself. Eric, who was weak and sick from lingering pneumonia, told police that he hadn’t drunk any poison, didn’t need help and wasn’t going anywhere, Patricia wrote. When Eric stood up, officers asked him to sit down and he complied. Patricia said she and one of the officers began to walk down a short hallway between the living room and kitchen, where she wanted to show him a coffee cup from which her son may have drunk the poison. Eric was sitting calmly on the couch and the second officer was still standing by the door, she said. Eric had his hands in his pockets, Ross said, and when his mother and the officer left the room, he stood up and began trying to pull something out of his pocket. He started walking toward the other officer standing at the door. The officer, backing out the front door, told Eric to take his hands out of his pockets, Ross said. The officer drew his gun. Eric continued to advance across the yard toward the officer while still trying to pull something out of his pocket and ignoring the officer’s commands to stop and show his hands, Ross said. By this point, the other officer had come to the front door. Eric managed to work the object free, and when he yanked the black object out, the officer in the yard fired, hitting Eric once in the chest. The object was a cell phone. Josh Cantwell, of the Grant Lake Mental Health Center, places a Facetime video call to a mental health worker at the Vinita intensive outpatient center. Josh Cantwell, adult services administrator with Grand Lake Mental Health Center in Claremore, opens the iPad sitting on his desk. 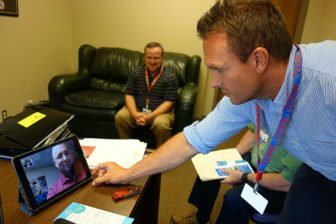 Using the Facetime application, Cantwell connects to one of Grand Lake’s mental health workers at the center’s intensive outpatient facility in Vinita. “There’s no more time barriers, no more distance barriers,” Cantwell says. Grand Lake began using iPads this year to communicate with mental health clients who may have transportation issues and to get updates from clients who have spent time in its intensive outpatient center. The center functions somewhat like a crisis center, but allows for longer stays as long as the stays are voluntary. 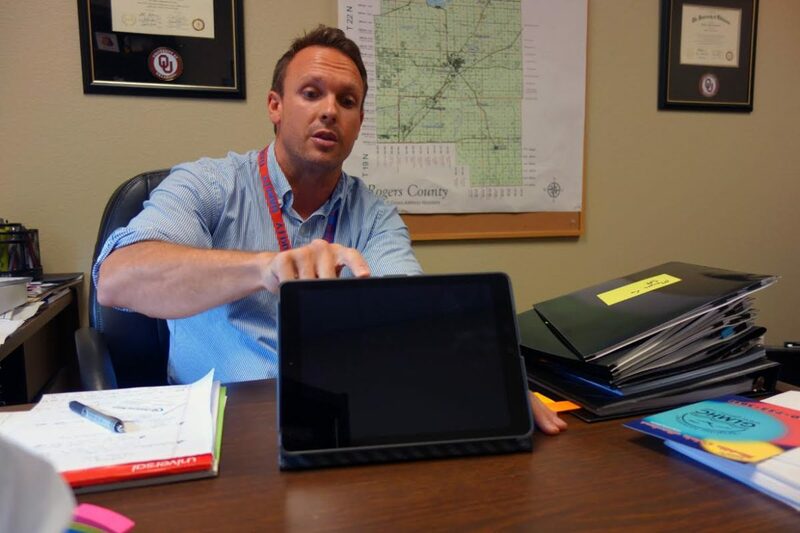 But it’s not just Grand Lake’s clients who are using the iPads – the agency has distributed dozens to law enforcement agencies across northeastern Oklahoma. The iPads allow officers who respond to a call about picking up a mentally ill person to contact the outpatient facility and have a face-to-face evaluation of the individual done immediately, even if the person is in the back of a police cruiser, Cantwell said. “We’ve always been at odds with law enforcement all around the state on the emergency detention order process,” Cantwell said, referring to officers often taking the mentally ill to jails rather than directly to treatment centers for evaluation and possible temporary detention. “It’s been an adversarial kind of relationship. Because of the iPad initiative and the Vinita intensive outpatient center for voluntary patients in crisis, officers are spending far fewer resources on mental health patients and are getting them to treatment much quicker, Cantwell said. Until the outpatient center opened, the closest facility for people in a mental health crisis was dozens of miles away in Wagoner. Usually, dealing with people who have mental illness took between four and five hours, Cantwell said, but with the iPad, it takes between 10 and 15 minutes. 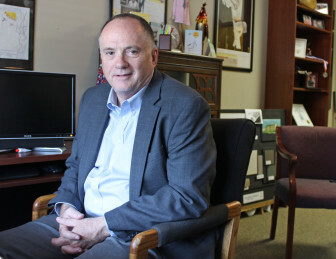 Both the iPad approach and the intensive outpatient center were born of necessity, because rural areas often have fewer resources than large urban areas, said Charles Danley, chief executive officer of the Grand Lake Mental Health Center . But despite the advances, more work needs to be done, he said. 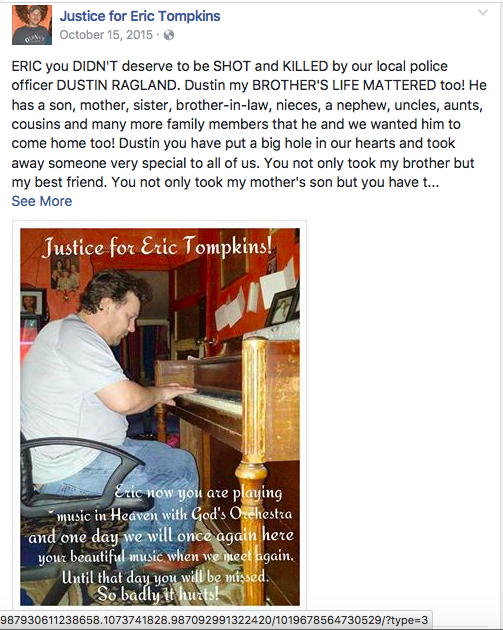 A posting on the Facebook page, “Justice for Eric Tompkins,” with a photo of Tompkins. Based on findings from the Oklahoma State Bureau of Investigation, Ross’s office declined to file charges against the officer, concluding it was reasonable for him to believe that he was about to be seriously injured by Tompkins. After the shooting, a third officer who responded said in a report that when he arrived, Tompkins was handcuffed and the other officers were attempting to render aid. That officer also rode with paramedics and Tompkins in the ambulance as it headed for the hospital. Tompkins died a short time later at the hospital. Eric’s family members declined interview requests by Oklahoma Watch, saying attorneys told them not to speak about the case.